A piece similar to this exciting amulet was found along the southern Siberian Coastline, in a stone foundation about 2350 years old. It is thought that this type of pendant was worn by high-ranking tribal-wives to make them hardy enough to thrive through the Siberian coast winters. (The silhouette of this amulet pendant is very similar to that of the outer parka worn by hardy Siberian hunters.) The Fossil Walrus Ivory that was found in this piece took on only minimal color from the surrounding minerals. 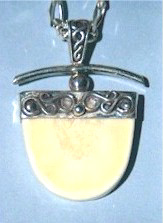 We found some Fossil Walrus Ivory similar in age near the site and used it for the pendant in the photo. Both front and back of this Creamy Ivory are visible below the Sterling Silver bezel. (It is also available in other Fossil Ivories.) Beads and swirls in applique on the bezel, as well as intertwined lines on the bail contribute to the intricacy. A provocative amulet. 1 5/8 inches high, 1 1/8 inch wide. Complete with Sterling Silver chain.